'Kinder Gentler Indifference': Activists Challenge George H.W. Bush's Record On AIDS The AIDS epidemic was a full-blown crisis during the presidency of George H.W. Bush. While his rhetoric was softer than that of his predecessor, Ronald Reagan, advocates say his actions fell short. ACT UP demonstrators shout and carry posters outside the 1992 Republican National Convention. As the remains of former President George H.W. Bush lie in state at the U.S. Capitol, LGBTQ activists and some journalists have been calling attention to his mixed legacy on the HIV/AIDS epidemic, which was raging during his administration. Bush died at the age of 94, on the eve of World AIDS Day, Dec. 1. The headlines have stood in counterpoint to the largely laudatory obituaries for the Republican leader. "George H.W. Bush Vilified For Neglecting AIDS," the LGBTQ magazine The Advocate wrote. "The Media Is Erasing George H.W. Bush's Catastrophic Harm To LGBTQ People," Michelangelo Signorile wrote in HuffPost. Bush signed two pieces of legislation that helped people with AIDS — the Americans with Disabilities Act, which protected people with HIV and AIDS from discrimination, and the Ryan White Comprehensive AIDS Resources Emergency Act, which provided funding for AIDS treatment. 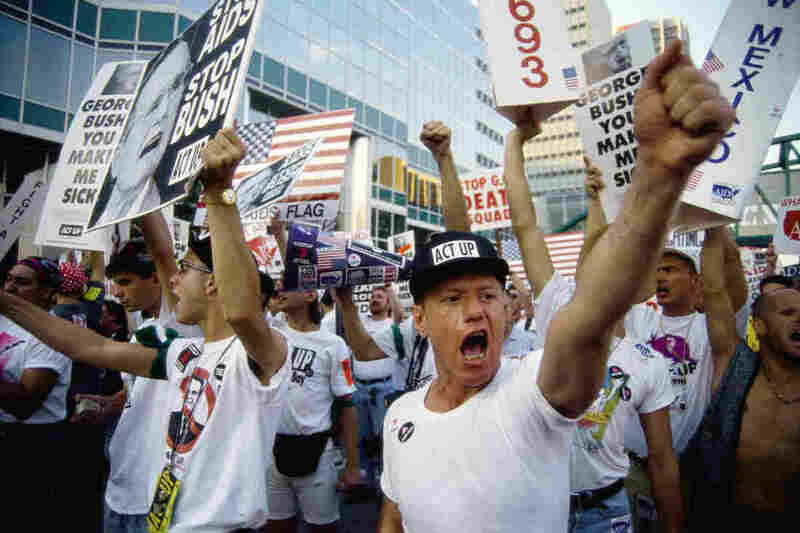 But during Bush's time in office, the AIDS epidemic grew dramatically in the U.S. and many other countries, and AIDS activists were frustrated by his lack of urgency on the issue. Among other things, his administration was famously reluctant to change a policy that blocked people with HIV from entering the United States — a major challenge for an international AIDS conference planned within the U.S.
"The Bush presidency on HIV/AIDS was mixed at best, and marked by calculated indifference at worst," Urvashi Vaid, who led the National Gay and Lesbian Task Force from 1989 to 1992, tells NPR. And more broadly, she says, Bush was not supportive of gay rights. "I think President Bush's tenure was noticeable for its absence of leadership on AIDS, by its opposition to LGBT nondiscrimination and rights, and by its capitulation to the anti-gay forces within the GOP," Vaid says. The Washington Blade, an LGBTQ newspaper in Washington, D.C., asked activist Larry Kramer for a comment on Bush. Kramer told The Blade, "He hated us." Bush famously called for a "kinder, gentler" America. But Garance Franke-Ruta, writing in New York magazine this week about her time as an AIDS activist, says his presidency was marked by "a kinder gentler indifference" on AIDS. Bush did give a speech about AIDS in 1990, in which he called for compassion toward people with AIDS and said he and his wife had friends who had died from the disease. But advocates said his softer rhetoric wasn't paired with enough meaningful action. And that speech was the exception, not the rule, as Dr. Mervyn Silverman, president of the American Foundation for AIDS Research, told NPR in 1991. "That the president of the United States has only given one speech on a topic that has taken the lives of over 120,000 people and caused disease in close to 200,000 is — is a sad commentary," he said. ACT UP, the AIDS Coalition to Unleash Power, repeatedly protested against then-President George H.W. Bush. Bush criticized the group's efforts as counterproductive. In 1991, hundreds of activists traveled to the Bush compound at Walker's Point in Maine for a protest designed to bring their voices to his doorstep. Laurie Cotter, of the New York chapter of ACT UP, spoke to United Press International about the protest in 1991. "With over a million more citizens infected with HIV, the United States still has no nationally coordinated plan to end the AIDS epidemic and President Bush continues to refuse to provide leadership," she said. In 1992, ACT UP activists spread the ashes of people who died with AIDS on the White House lawn. Eric Sawyer, an ACT UP activist, spoke to Out magazine this past weekend about those protests. Sawyer carried the ashes of his friend Larry Kert, at the request of Kert's partner. Thousands of people walked from the AIDS Memorial Quilt on the National Mall toward the White House, chanting things like "Bringing the dead to your door / We won't take it anymore," he remembered. Then, dodging efforts of the police to block them, they dumped ashes on the lawn. "It looked almost like a light snow had fallen," Sawyer told Out. "[T]he lawn was littered with this light dusting of ashes and bone ... from the urns, bags, and boxes we'd been carrying our lovers in. I'll never forget the look of it."